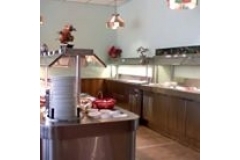 Your choices include eat in, take out, buffet, menu with vegetarian choices as well as fast food. Make reservations or walk in. Call about having a catered event. Hours,Tuesday to Thursday 11-9, Friday and Saturday 11-10 and Sunday 11-9. K.K. Restaurant is now starting a BRUNCH BUFFET for the weekends (Saturdays and Sundays) between the hours of 10 a.m. and 1:30 p.m.